Pat Heydlauff – a different kind of artist. Two decades ago, she left a stressful position in the corporate world to search for balance and a deeper meaning in life. She found it – in front of an easel. And it wasn’t long before she – and others – realized she had a genuine gift. Much of Heydlauff’s art is spiritual; it’s art with a message. Her spiritual works are thought-provoking, evocative and inspiring. She uses these elements to incorporate inspirations, balance and harmony into our lives today. Heydlauff is a Feng Shui and “flow of focus” expert, and her work has a sense of movement to it, drawing a sort of visual road map to a life of less clutter, less stress, and more harmony. Most viewers see something new each time they view her work. And many people have purchased her art for the express purpose of bringing balance and harmony to their homes. Pat Heydlauff’s spiritual art is meant to take the viewer on a visual journey that ends up as a personal journey as well holding up a world of possibilities that the viewer may have never considered before. It is calming and colorful, and often reminiscent of a gentler time and place. With lush color and tranquil movement, it’s designed to evoke a sense of joy in the viewer. Pat Heydlauff was asked by the prestigious Saatchi Gallery of London to exhibit her artwork in their online gallery. And her spiritual piece called “Ascension” was chosen for publication in the “Best of Florida Artists and Artisans” book, 2006. But Pat Heydlauff, a Florida resident, is much more than just an artist. She’s a widely-published writer, author of four books, Feng Shui So Easy a Child Can Do It, Selling Your Home with a Competitive Edge and The Way We Go, Your Roadmap to a Better Future which contains all of the artwork in Spiritual Artwork Gallery 2. She’s a noted leadership and productivity speaker at civic, philanthropic and corporate events. And she consults with businesses, organizations and individuals on how to create engaging workplace environments to unleash the flow of focus and personal environments to increase prosperity. 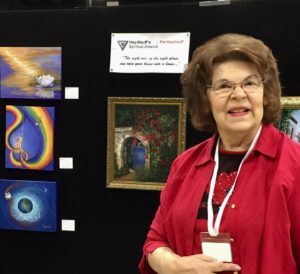 Heydlauff has exhibited at a variety of galleries and shows, among them the Juanita K. Hammons Performing Arts Center, (Juried Show), Springfield, MO; the Jupiter Town Hall Gallery of Art, the Friends of the Arts, Juno Beach, FL and the Eissey Theater Gallery at PBCC, Palm Beach Gardens. Her paintings are also displayed in such diverse places as the City Hall of Branson, MO, and the home of actress Barbara Billingsley.